Athletic Trainers (ATs) are healthcare professionals who render service or treatment, under the direction of or in collaboration with a physician, in accordance with their education and training and the states' statutes, rules and regulations. As a part of the healthcare team, services provided by ATs include injury and illness prevention, wellness promotion and education, emergent care, examination and clinical diagnosis, therapeutic intervention, and rehabilitation of injuries and medical conditions. Athletic training is recognized by the American Medical Association (AMA) as a health care profession. 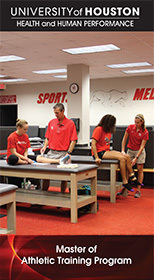 Students become eligible for BOC certification through an athletic training degree program (Bachelor’s or entry-level Master’s) accredited by the Commission on Accreditation of Athletic Training Education (CAATE). Students engage in rigorous classroom study and clinical education in a variety of practice settings such as high schools, colleges/universities, hospitals, emergency rooms, physician offices and healthcare clinics over the course of the degree program. Students enrolled in their final semester are eligible to apply for the BOC exam.